Popplet (which can be used online at www.popplet.com or as an App) has so many educational applications whether your students are brainstorming story ideas, organizing facts, or just creating a collage of images that relate to a topic or idea. 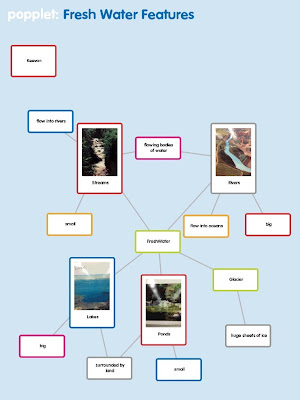 One of my 3rd grade classes used the Popplet Lite App (FREE) to organize information on their choice of fresh water or salt water features. The students found it very easy to add popplet (information) boxes and to link them together. When the projects were done, they were exported as .jpg images to the camera roll. The Popplet Lite App does have some limitations: only one popplet can be created on the iPad at a time (so this project will have to be deleted in order for another project to be created now), and images must be imported from the camera roll or taken by the camera (no import from Flickr). There is also no option to add video or for students to collaborate on the FREE Popplet Lite App. Although the paid version of the app would take care of these limitations, the $4.99 price is too steep to consider.